November 5th is a date of deep thoughts, words that may be hurtful but pick the core of the problem at hand, and all those dialogues that seem destructive but bring necessary change in the long run. People born at this time may feel pressured into silence, as they aren’t exactly tender when talking about important issues, but this will only make their energy pile up until they burst in a more destructive tone than that needed to begin with. A person born on the 5th of November is quick, witty and intelligent, ready to discuss all issues that might arise. Aware of their human strengths and weaknesses, they can be quite rational when it comes to their abilities or lack of them, and know how to assess the situation and turn it to their benefit even when the struggle is long and difficult. 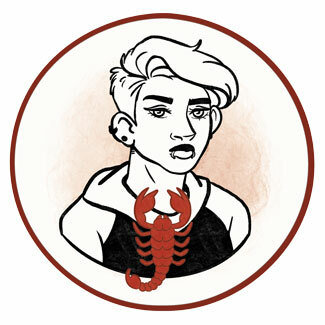 They are talkers among Scorpios and feel the need to express their attitude as clearly as possible, so that middle ground can be found. If they push too many things down their throat instead of sharing their point of view, they will inevitably burst into discussions that are heated and arguments that might have been avoided if they never gave in to suppression of their need to speak in the first place. "An Inventor Performs a Laboratory Experiment"
We can see that curiosity of people born on this date takes them in different directions, from beauty in movement to experimental research. Their mind will push them to incredible lengths, and they won’t settle for anything half-done for as long as it inspires them and sparks their mind and body to learn, absorb and create. Depending on the prevailing element in their chart, we will see that those with an emphasis on Earthly positions turn to movement, while those with accented element of Air turn to research. Still, two sides of Mercury are to be combined until they are satisfied with all areas of their life. The focus point of Scorpios born on the 5th of November is found in the essence of Uranus. This speaks of their liberation in time, as they discover that it is not up to them to shut down the core of personality they need to share, but up to others to embrace them with respect, fully acknowledging who they are. As they mature, they discover who their true friends are, and find it much easier to talk about things that truly interest them instead of engaging in small talk that drains their energy away. Their goal is to find the right social circle and good friends that will support them in their deepest truths. While self-expression presents the most important issue in lives of those born on November 5th, to be true to themselves and other people, they need to build a strong foundation in their heart. Intimacy is a special theme in their life as they might get overly rational and try to do things as practical and humane as possible, while forgetting to attend to their own emotional needs seeing them as a weakness. Their world of emotions needs to allow freedom of sharing and freedom of movement, and this has some trouble connecting with their own obsessive impulses when they fall in love. A partner they choose to stay with should always support their personal freedom and move in similar circles of friends as they do. They need shared topics and conversations with a steady emotional flow and shouldn’t hold back on honesty in any situation if they wish to feel calm in their bonds. The web of adaptive choices and compromise could distance them from their inner truth and make them deeply unsatisfied, leading to fiery breakups and sudden changes that leave them, or the other person, bruised. To connect in love and stay in it for years, they are to communicate without restraint and keep their focus on nurturing individuality of both people involved. 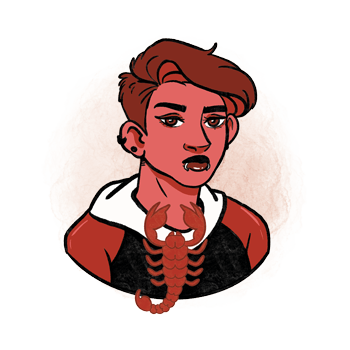 Scorpios born on the 5th of November make incredible and creative things in writing, communication skills and large social circles, and carry healing energy in their hands. They may become healers or social butterflies with a message for everyone in their life if they get light enough and confident enough to openly speak about things that know with certainty. They work well with modern technology, computers, in programming and equipment that others don’t understand well enough to work with. Innovators and curious diggers through information, they make great scientists and researchers who know their way through irrelevant details to reach the core of any issue. For those born on November 5th blue barite is a very good choice of healing crystal. It is a stone that boosts psychic communication and helps one get in touch with their higher purpose. It has been used by women in history for healing wounds that men received in battles and is known to set one free from different forms of trauma. It aids memory, thinking processes that need to connect to higher meaning, and helps one to bring down communication about higher issues on an earthly plane and into daily relationships with more ease. The choice of birthday gift for those born on November 5th may be a book on topics of interest, something quick to read, carrying practical knowledge or understanding of deep phenomena brought to a simpler plane. They want to get to the core of things and won’t really care for presents that are common such as flowers, pens and candy. A gadget with functions to explore, a new computer, tablet or phone, as well as a case for their old phone or something to add to their collection of items that make them productive, are a good idea. Spark some fireworks or spark their mind to get them excited for beauties of life. Witty, intelligent and aware of the core of any dialogue, they give important messages for those willing to listen and seek freedom and change in circumstances that are shallow or stagnant for too long. Unpredictable and stressed, they might push too many things down their throat only to explode in awkward situations. Unable to express their emotional needs, they might get stuck in rational solutions that don’t make them happy, becoming frustrated or rebellious, not really knowing why. In 1958 Robert Patrick was born, an American actor mostly recognized for his villainous roles, especially that of T-1000, the main antagonist of Terminator 2: Judgment Day. He worked as a house painter until a boating accident in 1984 when he nearly died swimming for three hours to save the others who were stranded on the accident site. In 1959 Bryan Adams was born, a Canadian singer, songwriter and guitarist, best known for his worldwide hit "(Everything I Do) I Do It for You". He founded The Bryan Adams Foundation to advance education and learning opportunities for children all over the world. In 1960 Tilda Swinton was born, an English actress who won an Academy Award for Best Supporting Actress in the film Michael Clayton. During a break from college she went to volunteer in Kenya with a gap year charity called Project Trust. 1895 – The fist U. S. patent for an automobile is granted to George B. Selden (born on September 14th). 1914 – The British Empire and France declare war on the Ottoman Empire in the course of WWI. 1925 – Execution of the first 20th century "super-spy", secret agent Sidney Reilly. 1940 – The first time that a President of the U. S., Franklin D. Roosevelt (born on January 30th), is elected to a third term. 2006 – Saddam Hussein (born on April 28th) is sentenced to death. 2007 – Google unveils Android mobile operating system.